W.R. Case & Sons Company proudly celebrates our Nations Chief Executive with the introduction of these Case Presidential Dollar Commemorative Sets. 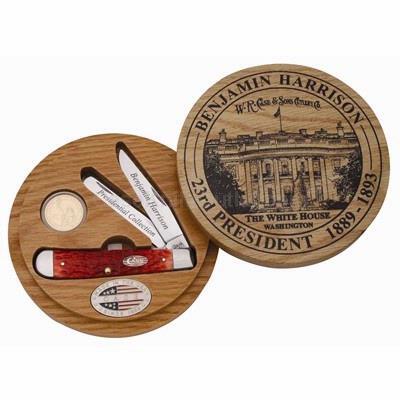 A Genuine bone handle Trapper with embellished Tru-Sharp® Surgical Steel clip and spey blades are paired with a One Dollar coin in a wooden display box. Each knife will feature the Case "Long Tail C" Serialization, Certificate of Authenticity and Collectable Medallion. Strictly limited to 500 pieces produced. Benjamin Harrison 23rd President 1889-1893. As with all natural material color and texture may vary. Made in the USA.